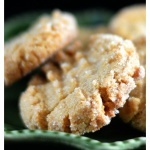 I tested this particular version of Peanut Butter Cookies multiple times before perfecting it. I decided to experiment with alternative flours this time around, specifically, almond and coconut. Boy did I have a lot to learn! The taste was great in my first attempts, but the texture wasn’t that of the peanut butter cookie I knew and loved. It was almost cake-like. Good, but not what I was going for at all. After a few adjustments, I have the perfect crisp on the outside, tender on the inside Peanut Butter Cookie! I also, for the first time, attempted baking cookies with a sugar-substitute. I think for this recipe, it’s imperative to find a granulated sweetener. These cookies really demand it. I noticed in testing these cookies that the recipes will call for more of the almond flour as it tends to really absorb all of the liquids and be much too soft to form the cookie we are looking for here today. I also tried to maintain a balance between the almond and coconut flour (which can be a bit overpowering if you are not a fan of, or used to). I couldn’t taste the coconut flour in the finished product. The other aspect of balancing those flours is the level of sweetness. Since I was also using a sugar substitute for the first time in baking, it required a few tweaks before getting it just right. In my previous attempt, I didn’t have the granulated version to roll them in. Again, for the perfect Peanut Butter Cookies, I feel this is essential to a successful outcome. I used this cookie scoop to get uniform cookies and then created cross marks using a fork. It was kind of like a chemistry experiment 🙂 But once I got things the way I wanted them, taste, texture, appearance…I was thrilled with the outcome. I honestly could not tell the difference between these and the ones I made from a traditional recipe. You know me, I love them warm from the oven with a cold glass of almond milk. Sooo good! 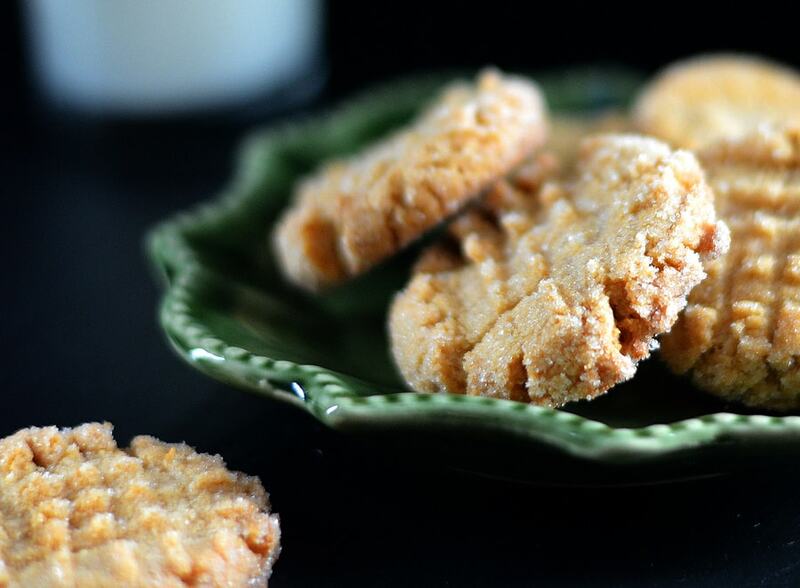 If you make this recipe for Peanut Butter Cookies, let me know what you thought in the comments section below. Did you make any changes? I always appreciate your feedback. 1 Egg Equivalent SUCH AS: 1/4 C unsweetened applesauce, 1Tbl Ground Flax + 3 Tbl Water, etc. In the bowl of an electric mixer, beat the margarine and peanut butter together until smooth. Add the remaining ingredients. If your dough appears too sticky when pressed between your fingers, add 1 Tbl more of almond flour. Using a small scoop, add the cookie dough to a small bowl of the granulated sweetener and roll. Arrange on a cookie sheet lined with a silpat or parchment paper, leaving room between them. Using a fork, make the cross marks on the rolled cookie balls. Bake for 8-10 minutes in the UPPER THIRD of the oven until golden. Do not over bake.